LOCATION: Aalto University Harald Herlin Learning Centre, Otaniementie 9, Espoo (Otaniemi), 1st floor Johanna meeting room. Sally Davison is a dance artist and choreographer whose work deeply attends to the existential qualities of the moving body and life more broadly, focusing in particular on aspects of inclusion, accessibility and equality. 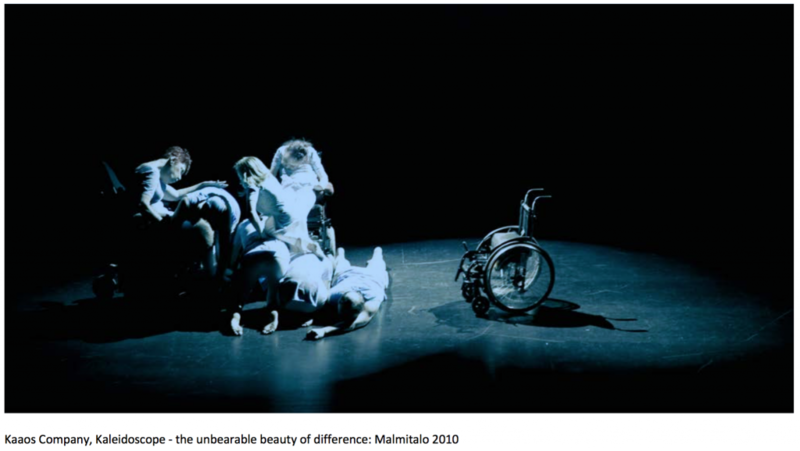 Davison is Chairperson of DanceAbility Finland ry an organisation dedicated to promoting inclusion through dance, and Artistic Director of Kaaos Company an inclusive professional dance company based in Helsinki since 2010. Abstract: This presentation illustrates research carried out with individuals from Dancehearts, a performance group for young people with disabilities. I seek to show that interactive media technologies can significantly increase the level of social empowerment experienced by individuals taking part in group public performance by magnifying the effect of their own actions and movement in the space. Using custom designed wireless electronic controllers, the dancers “play” music and sound using the movements of their bodies and wheelchairs. They are no longer purely a choreographed performer, but in addition they cause affect to the whole performance space through aural interaction, controlling the soundscape used in the performance. For the differently-abled person, the ability to harness media technologies for artistic expression challenges their perceived public role as passive object. They become, through their own actions, active subjects causing affect to the whole audience experience. Andy Best is a media artist, sculptor and educator, specialising in playful and provocative interactions and installations. Andy’s work tackles social and political themes, and he seeks collaboration in diverse spheres such as data visualisation, live performance, and physical interaction design. Between 2002 and 2013 Andy was principal lecturer of Digital Arts at Turku University of Applied Sciences. Since 2014 he has been lecturer in sculpture at Aalto University. Andy is currently Head of the Center for General Studies. He is a doctoral student at Aalto Media Lab, researching possibilities for social empowerment through collaborative interaction in media environments, with emphasis on working with people with disabilities. This entry was posted in Lecture, New Media, Seminars on April 6, 2018 by Saara.